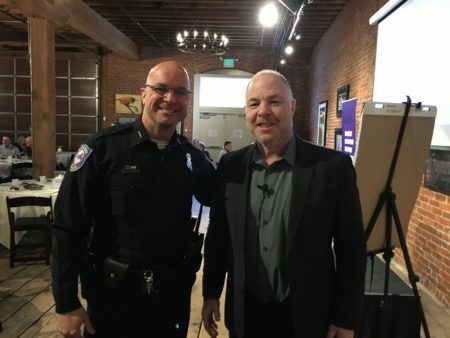 A growing movement of men in Spokane working to prevent domestic violence. 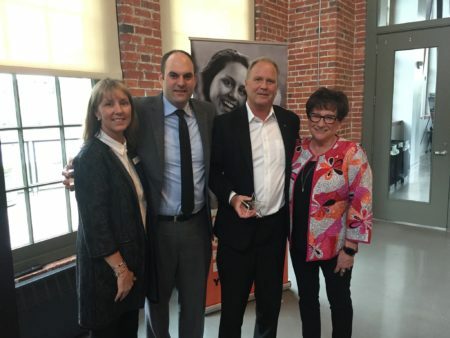 Co-founders and long-time YWCA supporters, Doug Kelley of Avista and Manny Hochheimer of Numerica Credit Union, joined together with YWCA to create a collaborative effort of support called the GoodGuys. Due to successfully achieving their goal of filling 10 tables with GoodGuys at YWCA’s 2016 luncheon, Kelley and Hochheimer were awarded YWCA’s 2017 Shining Star Award. This prestigious annual acknowledgment was given by YWCA staff members who recognized the importance of the GoodGuys’ impact on domestic violence in Spokane. Many thanks to the GoodGuys for hosting “What Does it Mean to be a Strong Man? : Exploring Men’s Leadership in Preventing Violence Against Women” at Gonzaga’s Hemmingson Center on Feb 11th. Jackson Katz explored the growing global movement of men working to promote gender equality and prevent gender violence. Katz is internationally renowned for his pioneering scholarship and activism on issues of gender, race, and violence. He has long been a major figure and thought leader in the growing global movement of men working to promote gender equality and prevent gender violence. We are thankful to our GoodGuys, especially co-chairs Doug Kelley and Manny Hochheimer, for bringing such an incredible leader to Spokane! One-in-three women and one-in-four men in Spokane are affected by domestic violence. The GOODGUYS believe domestic violence is a community issue that requires a community effort. It will take a commitment from ALL of us to make a difference. Thank you to the GoodGuys Committee! As a Table Captain, you are helping to create lasting change in the lives of the women and children who seek our services when impacted by domestic violence, homelessness, and unemployment. Our GoodGuys’ presence at these awards is incredibly meaningful to the community and to our agency; we hope you serve as a Table Captain with them! Sign up as a Table Captain: Register here or email Table Captain chair, Erica Hallock, at tablecaptain@ywcaspokane.org to sign up as a Table Captain for YWCA’s 36th luncheon held at the Davenport Grand Hotel on Thursday October 4th, 2018. Invite your friends/co-workers: Invite 9-10 friends/coworkers in your network to join you at this year’s awards celebration. Let them know their attendance provides crucial support for YWCA’s programs and services. Additional resource to support your success will be provided below as we move closer to the event. Have your guests register online: Direct each of your guests to our online registration form with a request to provide your name as their Table Captain. This will ensure your guests sit at the same table with you. If possible, share verbal commitments with the Table Captain Chair at tablecaptain@ywcaspokane.org to help us prepare for a successful event. As a part of domestic violence awareness, supporters of the movement wear purple as a visual stand against domestic violence. Why purple? In the United States military, the Purple Heart is presented to those who have been wounded while serving. For survivors of domestic violence, who may also be wounded both physically and emotionally, the color is meant to be a symbol of peace, courage, survival, honor, and dedication to ending violence. Each October, Domestic Violence Awareness Month (now Action Month) is celebrated. It was first observed in 1981 as a national day of unity. It was established by the National Coalition Against Domestic Violence to ensure that victims know help is out there and that they are not alone. Nearly 75 percent of Americans personally know someone who has been a victim of domestic violence. In Washington State, the fatality report now shows 68 domestic violence-related deaths in 2015. We must bring greater awareness to this problem and eliminate the stigma that dissuades victims from seeking assistance. We look forward to growing this community of Spokane men who will no longer stand for domestic violence. Share the GoodGuys movement with your friends, co-workers, and family and help us end domestic violence! Help YWCA Spokane and the GoodGuys movement continue to grow with a financial commitment to this work.